Inspired by the new season of shows that include a new Lupin III, more Eureka Seven, and newbie-friendly Saint Seiya, we jump into a discussion about anime which expand their settings or characters over time. Not every series is written in a way to extend it into an ongoing franchise so when a series is ridiculously popular the creators usually have to work some major mojo to be able to create new material. The simplest way it to create a sequel or a prequel but you can’t always do that especially when a story has a very hard beginning, middle, and end. Sometimes they must find a way to retell the same story with a new twist. Other times they explore different parts of the universe they created away from or only tangentially related to the original story. This podcast focuses on what works and what does not when you expand on a story. Also we give our secret wish list to what stories we would love to see more of. 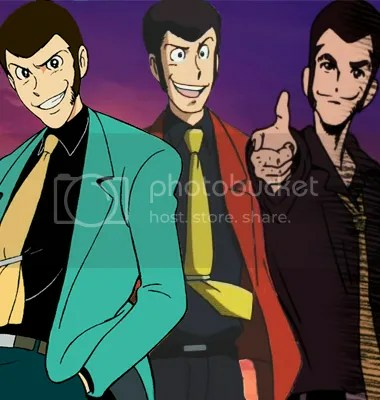 I like the Lupin on the far right. He looks like Quentin Tarantino. This expanding universe thing that some franchises love to play with remind me of the whole gaiden thing. With that premise, you can pretty much go hog-wild with the characters in the original story, but also retain that universe. The Simpsons kind of do that, too. Recently, I finished Angel Beats, and while I enjoyed the ending, I liked how they also made an alternative end scene that kind of changes the perspective of the protagonist in a dramatic way – and even leads a way to a sequel if they wanted. In the same vain, even OreImo did something similar. I *hated* the TV series ending, but in an OVA they had what they called a “true ending”, which I guess is based off the manga. Now, we are apparently getting a second season of the series. Oh, and the Madoka manga using new and old characters. Actually, I think everyone except Madoka makes a reappearance, iirc. A good gaiden series can really expand a setting and open the door for a world of material whereas a bad one can just seem like a waste of time and possibly kill a good deal of interesting in a universe. But such is any unplanned expansion to a story. Well as we mentioned in the podcast the Transformers continuity is so Byzantine and contradictory I am sure it could give Zelda a run for its money. They both only sort of maybe work from a distance but the second you get close they devolve into insanity.